[NOTE: As of June 2017, this unit is currently unavailable, while we re-engineer it to match the new design of the Power Pallet]. 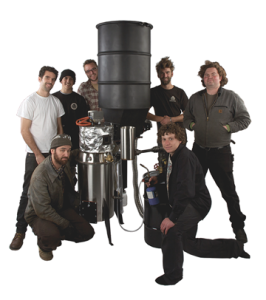 ALL Power Labs began in 2008 by selling small-scale gasifier kits for DIY enthusiasts and university researchers. Our intent was to provide a LEGO kit of gasification to spark new work and new conversation in the relatively uneventful field of biomass thermal conversion. 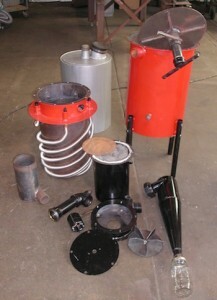 Over the following years we were amazed at the interest these kits generated globally, and the acceleration of collaborative research and knowledge exchange that followed.We ultimately found that a gasifier based power generation system–one that actually delivers on its value proposition–requires an integration of components and high level automation that a raw DIY kit cannot provide. Thus for years we have said no to the continuing requests for these kits, and instead directed people to our full power generation systems.This did not stop the requests, nor the desire/belief of many people that they can build out the system themselves. So after years of resistance, we’ve figured out a new scenario for offering a more basic gasifier kit based on our dramatically improved v5 gasifier, but still with a level of integration and automation that keeps it meaningful for actual use. The new GEK Gasifier kit is a complete gas making system: from fuel feed through filter, with all controlled by our full automation and mixing system from the Power Pallet. Or considered from the other direction, the new GEK Gasifier kit is the complete Power Pallet minus the engine, genhead, engine governor, and various engine related accessories. The new kit comes completely assembled, skidded and commissioned, not as raw parts for you to puzzle together. No, we still cannot sell the raw gasifier without the automation. 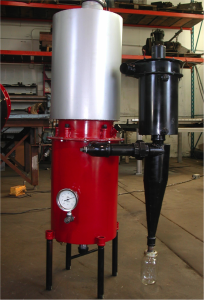 The fuel feed, pressure sensing grate control, ash out auger, tar cracking temp control, gas/air mixing, and safety shut downs are all dependent on the smarts of the automation. Attempts by us and others to fudge this with simple timers and other manual stand ins don’t really solve the problems of gasifier variability and stand alone operation. However, with our full automation system still intact, these systems remain complete, integrated, and enabling hands off operation. The remaining integration with an engine/generator is tractable. It is not trivial, but it is doable by your typical enthusiast of rotating machinery. You will need to set up the genset governor, route the engine exhaust back through the pyrocoil for the externally driven pyrolysis of the GEK TOTTI design, and run various wires and instruments from the engine back to the automation PCU. The PCU can/will start and control the engine like on the Power Pallet, but you’ll need do wiring specific to your engine. The system ships complete and ready to run after minor reinstall of hopper and flare. 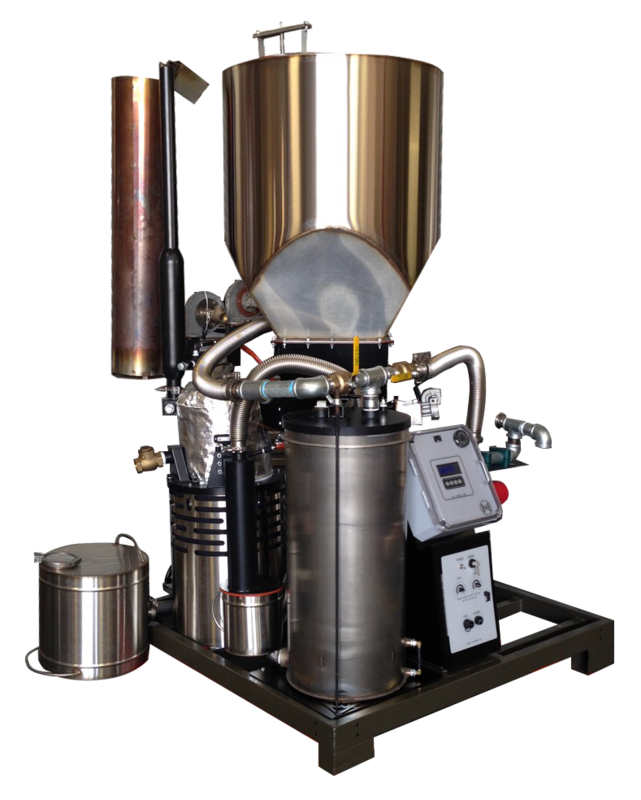 Every system includes the GEK v5.0 reactor, hopper, auger feed, cyclone, filter system, premixed flare, gas/air mixing system with O2 sensor, ash out auger, and PCU automation system. 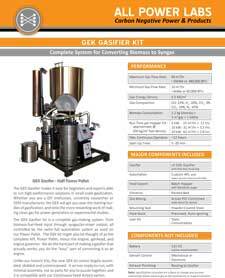 For more information, please refer to the GEK Gasifier Kit Datasheet. 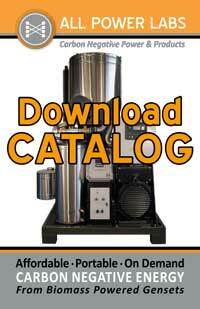 To place an order or to learn more, contact our Sales Team. We expect to ship 60-90 days from time of order. We ultimately sold over 300 of these kits before they were eclipsed by our work on the Power Pallet. We’ve come a long way, baby!